WorldMovieStore - Margin Call Sinopsis. Once Sullivan analyzes the data, he realizes the universal gravity of Dale's warning - that the firm is so over-committed to underwater mortgage-backed securities that the total potential loss exceeds the firm's total market capitalization value. Tucci is excellent in his smallish role as Dale and gets to show off his resigned character's engineering aptitude with a brief monologue about building a bridge. Comparatively less impressive but playing their more predictable roles fitfully are Penn Badgley as Sullivan's younger, overtly money-obsessed colleague Seth Bregman; Paul Bettany as Dale's nihilistic, snake-oil salesman of a boss, Will Emerson; and Simon Baker as the most morally despicable executive of the bunch, Jared Cohen. Mary McDonnell has a brief and frankly unnecessary scene as Rogers' ex-wife, and I didn't even recognize the usually hilarious Broadway personality Susan Blackwell as the hatchet woman in the opening scene. There are a few flaws with Chandor's observant screenplay, for example, the overly analogous scenes of Rogers dealing with his dying dog and a rooftop scene that plays up Emerson's nihilistic nature too predictably. Read More Sinopsis. 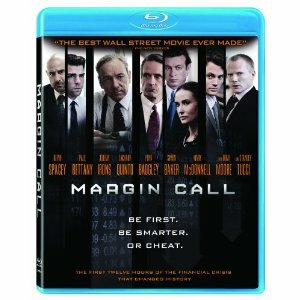 0 Response to "Blu-ray Release Margin Call"